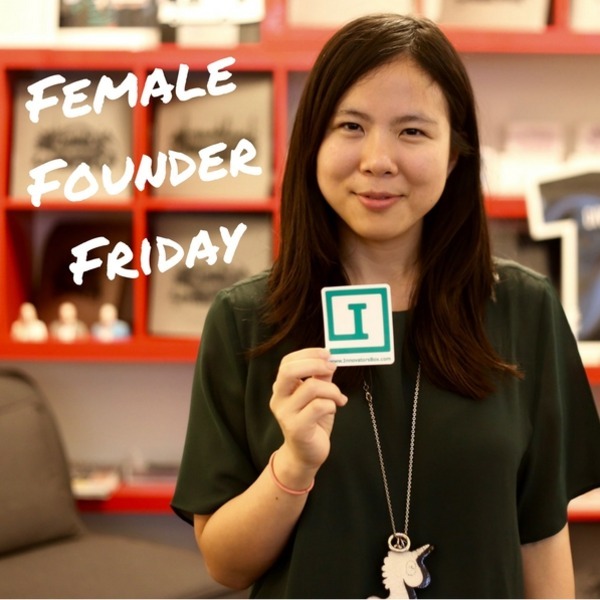 It’s Female Founder Friday! I am excited to highlight the story of DC woman entrepreneur, Monica Kang. She is an excellent example of someone with an education in a specific field who had the courage to change course, and do something very different. Monica and I met on a panel after the screening of “She Started It.” She is incredibly smart, motivated, and fun to be around! Monica is the founder of InnovatorsBox. Her company aims to redefine human capital potential and workforce culture by empowering all professionals with creativity and creative confidence. InnovatorsBox offers creative educational workshops, services, products and a diverse community for all professionals to learn why creativity is critical, how to integrate and hone it at work and in life. If you are a woman considering “changing lanes” with a business outside your field of expertise or education, Monica’s answers to my questions below are particularly insightful. InnovatorsBox was a service I desperately needed. It all started when I felt stuck in my dream career. The lack of creativity in nuclear nonproliferation made me risk-averse. I couldn’t remember the last time I created something on my own because I wanted to. It wasn’t until I integrated creativity into my daily routine that things changed. Productivity skyrocketed, I got promoted and I was able to share new insights and perspectives with top clients. On a personal level, I found myself less stressed, more confident and more eager to attack the next big project. I soon realized that I was not alone in this struggle. In fact, according to Gallup studies in 2016, 87% of professionals in the world feel stuck and a lack of a creative outlet. Learning this, I decided to gather my diverse expertise to create a space for professionals to rediscover their creativity. This is why I started InnovatorsBox. It was tough knowing that what if I got this all wrong. But now that I have stick to this and saw the impact for the past year, I know that we are heading the right direction. Growth! 2016 was a great start for us to validate our services and understanding our target audience. In 2017, I am looking to grow my clients, dive deeper into unique scaling approaches, strengthen our community and start working more directly with mission-driven projects and international projects to build a greater impact. I am also planning to write a book by 2018 on creative thinking and insights on changing workforce and culture development to dive deeper into the question of how can we maximize human capital. There is so much more to explore and I want to shed some insight and empower more individuals and help them find their full potential! Just do it. You will only know how amazing, daunting, exciting and impactful it will be when you do it! There is no perfect timing nor enough resources so don’t let that delay you from starting. And starting does not mean you leave your job. It means start with thinking and asking more questions like why do you want to do this, why you, what can you provide uniquely, how are you going to solve this and what do I need to do to get where I want to be. Be daring with your ideas and be bold with your execution. Be kind and open-minded to the people and the life you are about to go through. And don’t forget to enjoy the ride. The path is bumpy but you will learn a lot. Tie them together and strive to climb the next mountain. La La Land’s “Another Day of Sun” is my latest jam! Love how upbeat it is which reflects my day to day energy level but how driven, optimistic and realistic it is. Someone told me that true entrepreneurship is the person who just won’t give up and keep stand right back up and I think that’s the spirit the song reminds me if you really study the lyrics. Some days are tough and hard to chew but when you put your mind, passion and hard work together you’ll head to the right direction sooner than you think.